The first time I went to a Renaissance fair, I didn’t quite know what to expect. I understood from the ads that there would be jousting, music, crafts, and people walking around in period clothing, but that’s about it. In theory, a Renaissance fair is supposed to be a re-creation of 16th-century (give or take) England. That sounded interesting, but I wasn’t entirely sure what it meant. As I explored the fairgrounds, playing primitive arcade games, sampling the crafts, and watching the shows, I was alternately delighted and annoyed by the ubiquitous displays of pseudoauthenticity. I smiled when a guy walked up to me and, wanting to know the time, asked “How stands the hour?” but just rolled my eyes every time I saw a merchant with a sign that read “Master Card and Lady Visa welcome here.” Everyone seemed to speak faux Shakespeare. Those in costume wore custom-made boots that looked believable until you saw the Vibram soles. And everything, of course, had a commercial gimmick. But no matter—it was still great fun. It was not long before I turned my attention to acquiring some authentic Renaissance food. The roasted turkey legs were quite popular, as was corn on the cob—both believable as period foods. I tried something called a “Scotch Egg,” which was a hard-boiled egg, rolled in batter, covered with ground pork, and deep-fried. Appalling—they might as well have called it Death on a Stick—but delicious. And of course, I needed something to wash all this down with. I couldn’t possibly bring myself to buy a Coke or a Budweiser (both readily available), so I looked for the most authentic-sounding drink I could find. Sure enough, some of the vendors were selling mead. All I knew was the name—I had no idea what was in it or what it tasted like—but I proffered my gold (card) and got a nice authentic plastic cup full of a pale yellow liquid. Honey, Would You Like Some Wine? Mead is a type of wine made from honey rather than grapes. To modern ears that sounds like a contradiction in terms, but almost any kind of sweet liquid can be made into wine, because the yeast that cause fermentation aren’t especially picky about what kind of sugar they feed on. Mead looks about like white wine, and tastes like…well, it tastes like mead. I was about to say it tastes like honey, but that’s not quite right, any more than wine tastes like grapes. You can detect a family resemblance, sure, but the flavor is distinct. Furthermore, there are hundreds if not thousands of varieties of mead, and the flavors have as much variation as those of wine. Some are quite sweet while others are dry; some are fruity while others are earthy, and so on. It depends on the kinds and amount of honey used, the type of yeast added, the presence of other flavoring agents, details of the fermentation process, and numerous other factors. Mead-making techniques, and the resulting flavors, also vary from one part of the world to another. At our favorite Ethiopian restaurant, for example, we drink a type of honey wine called Tej, which is much different in character from English or American mead. Over the millennia, mead has found its way into legend, mythology, and literature countless times. Mead appears in Beowulf; the Aeneid; The Canterbury Tales; and ancient Greek, Roman, and Norse myths. Among its other sterling qualities, mead has often been considered an aphrodisiac, if not a magical potion. Scholars of Roman mythology suspect that the term “nectar of the gods” is in fact a reference to mead. And according to one popular—if possibly apocryphal—etymology of the word “honeymoon,” the ancient Babylonians had a custom whereby a newly married couple would consume mead every day for a month (that is, a “moon”) to ensure male offspring. Mead was eventually supplanted by beer and grape wine because the ingredients for both are cheaper and more plentiful than honey. But recently mead has been making a comeback, both commercially and as favorite project for home brewers. 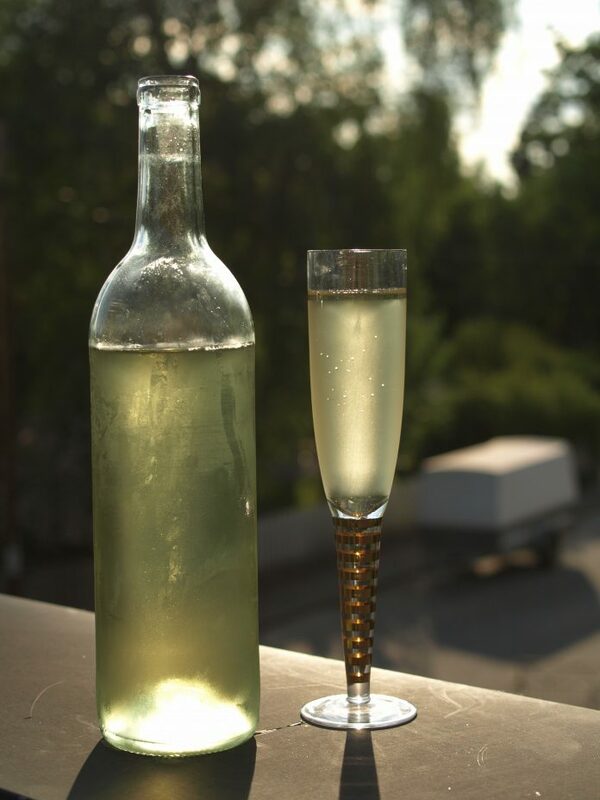 The very simplest kind of mead requires just three ingredients: honey, water, and yeast. To oversimplify greatly, you combine the ingredients and wait. Depending upon the recipe and the method, mead will take from one to several months to ferment, and after bottling, must age another few months for optimal flavor. I’ve enjoyed the few varieties of mead I’ve tasted, though more as a novelty than as a substitute for grape wine. I’m sure it won’t become my primary source of liquid as long as I have a safe water supply. Nevertheless, I do very much like the idea of mead—the notion that I’m drinking an ancient and mysterious beverage, quite literally the stuff of legend. Note: This is an updated version of an article that originally appeared on Interesting Thing of the Day on July 10, 2003, and again in a slightly revised form on June 15, 2004.